The laser label marker allows precise marking of labels of different sizes straight from the roll and cut them out without the need of additional tools. After the marking, labels made of laser markable foil can be separated by a cutter or externally rewound. Overview: Which modules can be integrated into the different laser marking systems? 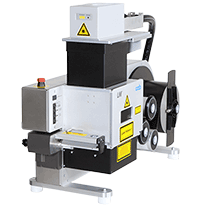 The laser label marker allows to precisely mark and cut labels in different sizes out of continuous material without the need of additional tools.